Lid hygiene is not really something that most people would think about, much less practise. However, it should be an important part of your overall hygiene. Just imagine the amount of dirt and dandruff that can gather on your eyelids and eyelashes daily. Just imagine how much debris can accumulate over several weeks and even months! And just imagine how much germs can proliferate and hide within the crusts and dead skin at the base of your eyelashes. By not cleaning your eyelids and getting rid of all these unwanted dandruff and debris, you are increasing your likelihood of developing eye problems such as blepharitis, dry eye and infection. These eye problems can usually be considered mild, but can be severe enough to cause a significant reduction in quality of life, and even blindness if not managed properly. Lid hygiene should therefore be an important part of how you look after your eyes. It is the most essential step in the treatment for blepharitis and inflammation of the meibomian glands (oil glands in the eyelid). HOW DO YOU PERFORM LID HYGIENE? The simplest way is to use a cotton-tipped bud, dipped into diluted baby shampoo, to scrub the edge of your eyelids and the base of your eyelashes. Dilute the baby shampoo into a 50:50 mixture with clean boiled water. You may increase or decrease the concentration of the shampoo according to how effectiveness of the mixture. Some people suggest using bicarbonate of soda or even salt water. There are also some commercial lid cleansing solutions available. It really doesn't matter which you use, as long as it is comfortable for your eye and you can see definite improvement. You may have to try different solutions and concentrations before you find one that suits you the best. There is also a commercial eyelid scrub combined with tea tree oil that may be beneficial for Demodex-related inflammation. Instead of cotton buds, you may prefer to use pads or a clean washcloth or commercially available lid wipes. Again, it doesn't really matter what you use. The most important thing is that you are able to scrub your eyelids effectively whichever method you use. When you scrub your lid, you have to be firm but gentle to be able to get the crusts of the base of your eyelashes. It goes without saying that if you are poking the cotton bud or pad into your eye while cleaning your lids, you are doing it WRONG! Always wash your hands and always use a clean bud or cloth between eyes. Please do not use other people's towel to clean your eyelids!! The upper lid is usually the more difficult to clean, but do persevere and you will feel the better for it. For best results, perform lid hygiene twice daily initially. Once you get better at doing it and your eye feels more comfortable, you may be able to reduce this to once daily or even just a few times a week. When performing lid hygiene, start from the nose-end and scrub towards the ear-end. Initially doing this can cause your eyelids to feel slightly sore, but you will eventually feel better for it. For best results, incorporate lid scrubbing into your daily routine. Before performing lid hygiene, there are additionally 2 things that you can do to help improve your symptoms of blepharitis: warm compresses and lid massage. Warm compresses: Warm compresses softens the crusts at the base of your eyelashes, which makes the crusts easier to remove. The warmth also softens and loosens the secretions in the meibomian glands, which makes them easier to drain out of the glands. To perform warm compresses, dip a clean cloth or pad into warm, boiled water. After that, place the cloth over your closed eyes around 5 minutes. While the warm cloth is still over your eyes, gently masssage or rub your lids. Lid massage: Massaging the eyelids can help to loosen the contents in the meibomian glands. You may even be able to express the secretions that had previously been clogged up. This is very good for posterior blepharitis, and is very effective when performed together with warm compresses and lid hygiene. First, wash your hands. Close your eyelids and use your fingers to stroke your lids in downward motions (for upper eyelids) or upward motions (for lower eyelids). Do this throughout the entire length of both your upper and lower eyelids. Lid hygiene is by far the most important way to treat blepharitis. Similary to brushing your teeth, lid hygiene should be performed over the long term, regardless of whether your eyelids are giving you problems or not. Sometimes, you may gain additional benefit from other treatments. These treatments must be performed in conjunction with lid hygiene, and not as its replacement. Reduce eyelid irritation: This sounds really obvious. The more irritated your eyelids are, the more inflamed they will become and the more uncomfortable your eyes will feel. So if you are a contact lens wearer, try to discontinue their use or at least reduce the number of hours you wear them. Reduce the amount of mascara and eye makeup that you wear to minimize the amount of chemicals you apply onto your eyelid. Eye lubrication: If you have blepharitis, your eyes will dry and irritated. There are many ways to treat dry eyes. The most common is to use artificial tears, gels and ointments. If your dry eye is severe, you may require occlusion of the tear ducts to stop your tears from draining too quickly from your eye. Omega-3 fatty acids, plentiful in flaxseed oil and fish, may help maintain the normal secretion of oils from your meibomian glands. Antibiotics: Antibiotic ointments, such as Chloramphenicol or Fucidic acid, are useful if you have an infection of your eye or blepharitis associated with the Staphylococcus bacteria. 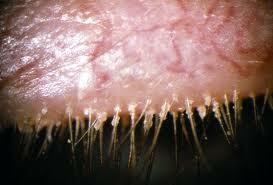 If you have blepharitis associated with Demodex mites, you may benefit from Metronidazole gel. Ointments will smear your vision, but will stay longer in your eyes and have a longer anti-bacterial effect. For the best effect, make sure the ointment is rubbed onto the edge of your eyelids. Your ophthalmologist will most likely advise you to use the antibiotic ointment twice daily for 4 to 6 weeks. On the other hand, antibiotic tablets such as Doxycycline and Minocycline are typically taken over 3 months. Apart from reducing the amount of bacteria on your eyelids, they also inhibit the production of free fatty acid from your meibomian glands. This is good because free fatty acids destabilizes your tear film and promotes eyelid inflammation. Your ophthalmologist will recommend that you take these antibiotics if you have meibomian gland disease and posterior blepharitis. However, these antibiotic tablets may cause stomach upsets, make your skin more sensitive to sunlight, and interfere with your other medications. Please inform your ophthalmologist if you are taking warfarin to thin your blood because these antibiotics will increase the effect of warfarin and so your blood will become even thinner and you will bleed a lot more easily. You should not use these antibiotics if you are pregnant or are breastfeeding. 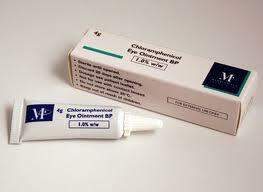 Steroid eye drops: Most people with blepharitis will have inflamation of the eye as well as the eyelids. In severe cases of inflammation, steroid eye drops such as Prednisolone 0.5% (Predsol) and Dexamethasone 0.4% (Maxidex) will help to settle the inflammation. 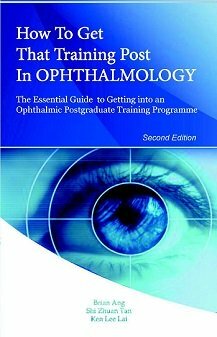 This is particularly important if you develop keratitis (inflammation of the cornea). Usually you will be asked to instil the steroid drops 3 or 4 times a day, and then slowly tapering over the next few weeks. Although your eyes may feel a lot better with the steroid drops, you should stop them when advised to do so. Long-term steroid use is associated with cataract and glaucoma.